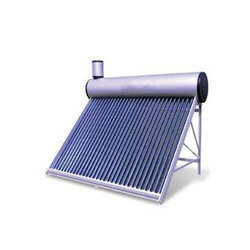 We are leading manufacturer and trader of Solar Water Heater. 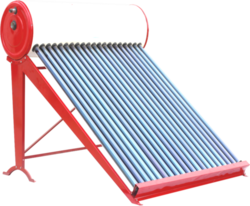 As a reputed organization of this industry, we are broadly engaged in offering Solar Hot Water Heater that is developed from the latest tools and technology and have a longer functional life. Our offered heaters are commonly used at varied residential and commercial places for heating water. These heaters conserve solar heat and then convert it into energy using it for heating water & also work on the principle of renewable energy. Greater absorption area per day, up to 94% auto sun tracking. Better performance in winter & cloudy days. Require a smaller roof area than comparable FPC. 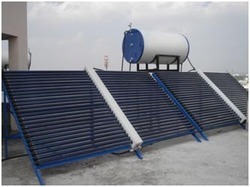 Using new ideas and innovative concepts, we are highly engaged in offering a qualitative Industrial Solar Water Heater finds wide application in power plants, processing industries, pharmaceutical industries, hotels, apartments and more. The offered water heater is manufactured by our team of skilled workers by utilizing quality approved raw materials and the latest technology in adherence with the set quality standards.